Birds tend to be found in predictable locations, and as experienced birdwatchers that’s where we usually look for them. Hawks soar on thermals, so we search high in the sky. Shorebirds prefer the water’s edge, and we usually look for them next to the ocean. And ducks congregate in clusters on lakes and ponds. But the wood duck, as its name implies, is sometimes found on the branch of a tree. If you’ve never seen a male wood duck, prepare for a treat. The scientific name of the bird is Aix sponsa. A rough translation would be “waterbird in bridal dress.” About half the size of a mallard, he is the most colorful member of the duck family, and many artists and birdwatchers consider him the most beautiful duck in North America. Here’s a description from one of our many bird guides (Master Guide to Birding). These extravagant feathers and the excellent taste of wood duck almost lead to its demise by the early 20th century. The feathers were used for everything from woman’s hats to fishing flies, and the meat was sold extensively in “bird markets.” There was such demand for the birds that some hunters used what were called punt guns which could kill as many as fifty floating birds with a single shot. There had been large numbers of the birds in the wild, but the combination of habitat loss and lack of hunting restrictions led to their numbers falling rapidly. The situation became so serious that the Migratory Bird Treaty of 1918 forbid the shooting of any wood duck, and the restrictions were not lifted for the next 22 years. Enough people were concerned with the wood duck’s situation that it became popular to build and maintain wood duck nest boxes. The birds accepted the artificial nests, and combined with their new protected status, the wood duck made a spectacular recovery. Putting out nest boxes is still popular in many parts of the country. As this continent’s only native perching duck, each breeding season the woody seeks out a nest in a hollow snag. Sometimes they will use an abandoned pileated woodpecker hole, which might have the advantage of wood chips lining the bottom. This can be important, since the wood duck doesn’t bring in additional nesting materials. It just adds a layer of its downy feathers to any rotted wood or sawdust found in the nest cavity. To facilitate its movement in a tree, in addition to the webbed feet common to water birds, the wood duck has sharp claws to help it balance on a branch or maneuver in and out of its nesting chamber. Even newly hatched chicks have the claws, using them to climb out of the nest shortly after hatching. 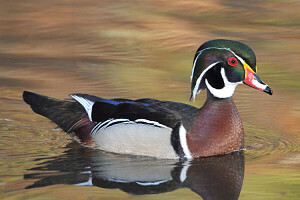 The male and female wood duck normally form a pair during late winter, and in spring the female leads her mate to the area where she was born. When the birds start house-hunting their preference is for a cavity at least thirty feet above the ground with a three or four inch opening. A snag sticking out of a lake is nice, but they will accept a spot as much as a half mile from water. The type of water is of secondary concern. Rivers, creeks, ponds, or marshes – all are suitable as long as there is a protected nest site. Once the house is in order, it’s time to lay the eggs. The female wood duck will lay one egg per day, usually in the morning, and continue until there are ten or twelve whitish-tan eggs in the clutch. Only then will incubation start, for as you will see, it’s important that all the eggs hatch at approximately the same time. The actual incubation period is about a month, and the day after the eggs hatch everyone leaves the nest. Permanently. Mother wood duck leaves first and calls to her chicks. The chicks, using the claws on their webbed feet, climb up to the nest opening. Not yet able to fly, they jump. Thirty feet. Sixty feet. Some nests are much more than 100 feet above the water. Some aren’t even over water. But the resilient little chicks are soon following Mom, either swimming or walking to their new home. The youngsters need a protected environment, preferably a watery area at least half covered by vegetation. The chicks can swim from the beginning, but it will be eight to ten weeks before they can fly to escape danger. During this time the female wood duck stays with her offspring. As the wood ducks grow, their diet gradually changes. For the first six weeks the chicks eat mainly high-protein animal material; insects, various aquatic critters, and small fish. After six weeks their diet has progressed to mostly vegetative material. One of the staples is a plant named, appropriately, duckweed. Later, as the birds become adults, they will add fruits and berries, nuts and seeds. During the winter a wood duck may live up to one of its nicknames, the acorn duck, making acorns one of its primary food sources. Wood ducks eat more fruit and nuts than any other American duck. Because of the success of conservation programs you can see wood ducks in much of the United States and the southern parts of Canada. Some areas, such as Texas, have resident woodys throughout the year, while others host a migratory population that moves to the southern states in winter. We’ve been trying for the last few years to reach one of our birding goals. Even though during nesting season they can be quite secretive, we occasionally see wood ducks when we are out birding. But we’ve never been able to see a batch of wood duck chicks as they tumble from their elevated home. Last year we’ve found a location where the residents have installed a number of wood duck boxes, but so far we’ve missed a bit on the timing. Maybe next year ….